There was a time when Bluetooth was a technology in search of a purpose. Now you’ll find the wireless protocol in everything from smartphones to speakers, headphones, light bulbs and yes, even toothbrushes. 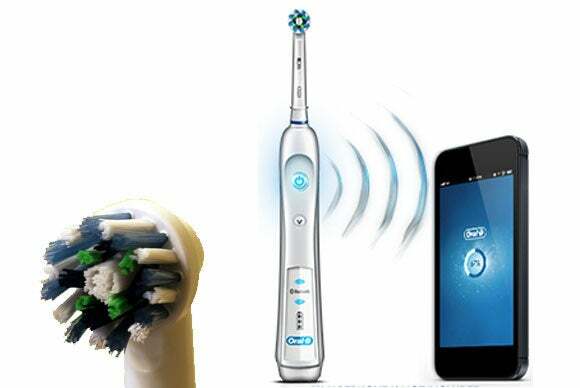 The smartphone app for Oral-B’s Pro 5000 electric toothbrush makes a game out of brushing your teeth, and that could encourage one person in your home to practice better oral hygiene—because its companion smartphone app can track only one person’s routine. Dumb as that limitation might be, the Pro 5000 left my teeth feeling almost as clean as if I’d just visited my dental hygienist. That’s pretty great. 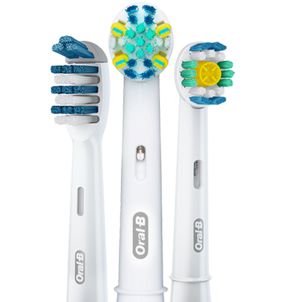 The kit comes with a charging stand for the battery-operated handle (Oral-B claims the battery will last 10 days on a charge, and that it cannot be overcharged). The stand has covered storage for up to eight brush heads, and there’s a travel case that can accommodate the handle and two brush heads. There’s only one brush head in the box, however, so you’ll need to buy more if other members of the family are to use the handle. Oral-B manufactures six different brush heads that work with this handle, including models designed to help clean dental work and around orthodontic appliances such as braces.The kit I reviewed came with Oral-B’s CrossAction brush head, which has angled bristles that the company says are optimized for removing plaque. 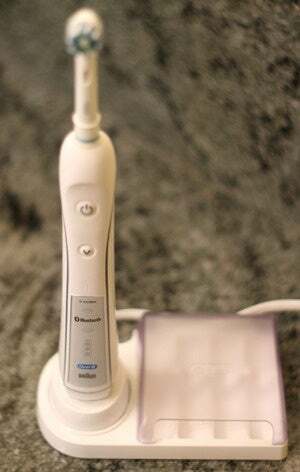 Dentists recommend changing your toothbrush every three months, so you should consider the cost of replacement heads if you’re thinking of buying this electric toothbrush. They cost quite a bit more than a regular toothbrush: Walmart, for instance, sells a three-pack of Oral-B’s Dual Clean replacement brush heads for about $20. The app will helpfully remind you to change brush heads every 90 days, so as long as you start using multiple heads all at the same time, you’ll know when to replace them. 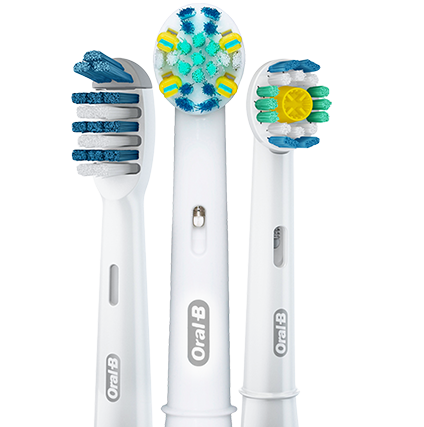 Three of the brush heads that are compatible with the Oral-B Pro 5000. The handle causes the brush head to oscillate, rotate, and pulsate. Since the brush head performs the cleaning action, all you need to do is hold the bristles against your teeth. I have a bad habit of using too much pressure when I brush my teeth with a regular toothbrush, but I didn’t feel that compulsion when using the Pro 5000. And when I intentionally pushed the brush hard against my teeth, a sensor in the handle caused a red LED to flash a warning, and the app displayed a message that I was using too much pressure. Once you pair the handle to your phone and launch the app, turning the handle on activates a timer in the app that's displayed next to a 3D model of teeth (with one quadrant highlighted). If you're using the default two-minutes-of-brushing routine, the handle will flash and vibrate every 30 seconds to inform you that it’s time to move to the next quadrant of your mouth. At that time, the next quadrant of teeth are highlighted. When your two minutes of brushing are up, the handle will flash a green LED, vibrate, and pulse the brush head to let you know it’s time to move on the next part of your oral hygiene routine: Cleaning your tongue. 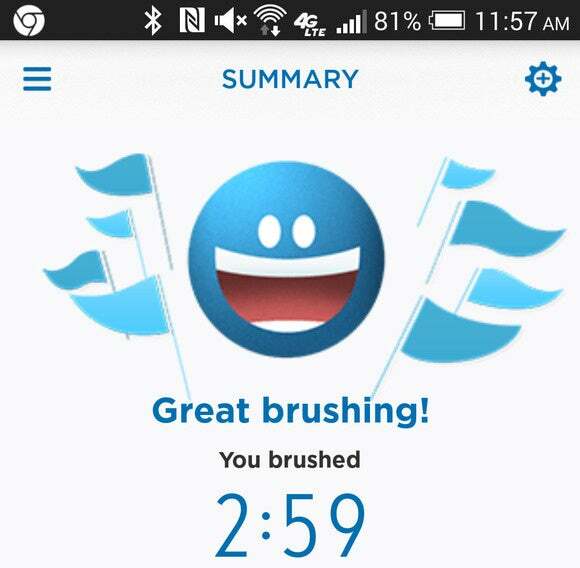 Once you’ve performed that task, the app reminds you to floss. When you’ve finished flossing, the app will recommend using a fluoride rinse to further help combat tooth decay. You can push a button to skip either of these steps, and the app will track how many times you do. 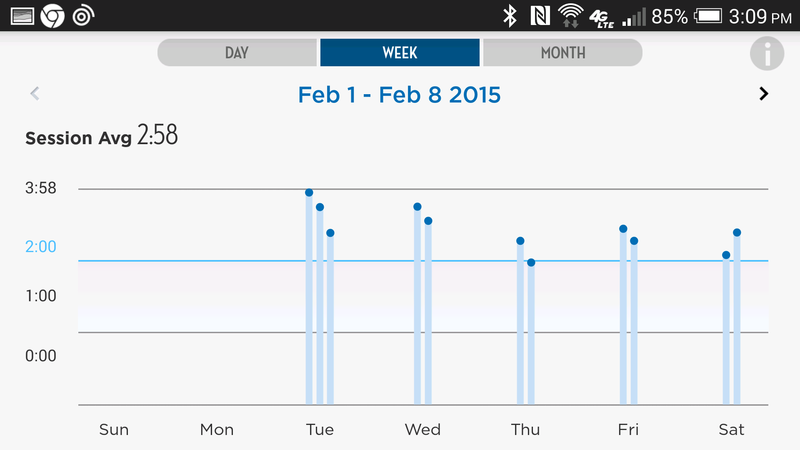 This graph tracks how many times I brushed my teeth and for how long. The app can also collect stats related to your flossing, tongue cleaning, and use of a fluoride mouth rinse. If your dentist recommends paying particular attention to certain teeth or areas of your mouth, you can configure the app to measure how long you spend cleaning those areas. You can set up to 16 additional timers for the cheek and tongue sides as well as the chewing surfaces of your teeth. The app will even find nearby dentists for you, using Google Places. If your dentist is interested, he or she can program the app’s reminders, focused care, custom timer, and recommended tips settings for you. Add your dentist’s contact information and you can call and schedule an appointment right from within the app. Enter the appointment details and the app will remind you up to a week before the date. I carry my phone with me pretty much everywhere I go, but when I started using the Pro 5000, I quickly discovered that I often don’t bring it into the bathroom when I brush my teeth. After the umpteenth time getting irritated that I had to go fetch it before I could brush, I discovered an overlooked section of the user manual that informed me the handle can store up to 20 brushing sessions and automatically upload them to your phone the next time you do have it with you when you brush. This would be particularly useful for families with children, since it won’t always be convenient to give up your phone when the kids need to brush. Unfortunately, this feature doesn’t seem to work. Kids will appreciate the fun feedback they get for taking good care of their teeth. If you need motivation to brush your teeth beyond the obvious reasons (avoiding tooth decay, painful and expensive visits to the dentist, and bad breath) you might find the gamification aspect of the app to be appealing. It didn’t do a lot for me (being married to the office manager of a pediatric dental office, I hear plenty of horror stories about people who don’t take care of their teeth), but I can see it getting children more excited about brushing on a regular basis. In addition to tracking your oral hygiene practices on a daily, weekly, and monthly basis, the app awards trophies for good behavior, including “Power User,” “Lunch Time Brusher,” and “Streak” plaques for brushing, flossing, tongue cleaning, and/or rinsing over consecutive 7-, 14-, 30-, 60-, 90-, 180- and 365-day periods. But that gamification feature would be a whole lot more useful if it tracked multiple users. That way, families could create contests to see who takes the best care of their teeth. Each brush head has a colored plastic ring so family members know which one belongs to them, but the app only knows when the handle is being used, not who’s using it. As such, it can track only one person’s routine. As I said early on, I really like the way my teeth feel after brushing with the Pro 5000. But I’m not sure the Bluetooth feature and the app adds all that much value, at least not for an adult. If one of your kid needs incentives to take care of their teeth, and smiley faces and trophies motivate them to do that, I suppose those features would help. But if you have more than one child, how do you choose which one gets to use the smartphone support without alienating the other(s)? If Bluetooth connectivity adds any significant bump in price over an electric tooth brush that doesn’t have Bluetooth, I’m not convinced it’s worth it. I don't know how much of the Oral-B Pro 5000's price tag is inflated by its Bluetooth feature and app, but it's not worth it.